Hitchcock chairs are a favorite collector's item for antique furniture enthusiasts who love the look of traditional nineteenth century American furniture. Even though they were among the first home furnishings to be mass produced, these chairs are well known for the attention to detail that went into producing chairs with a handcrafted, custom look. The concept for mass producing quality wood furniture was spawned in 1818 by a man named Lambert Hitchcock. Hitchcock was a master woodworker who got the idea for mass production from clock makers of the time that produced the interchangeable parts for clocks. His operation started in a small town in Connecticut, where Hitchcock began making chair parts from maple, birch and oak. 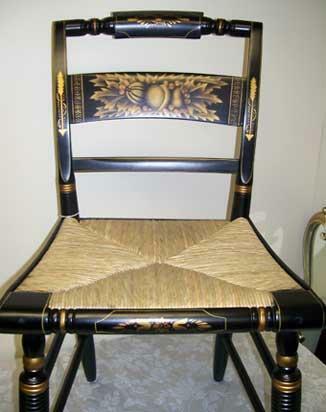 Instead of carving or inlaying the designs, Hitchcock used a stenciling technique to embellish the dark finishes on the chair parts. The company was able to produce 15,000 chairs per year. There are several things to look for when purchasing authentic Hitchcock chairs. Educating yourself on the defining characteristics of the furniture will help you determine if you are getting the real deal. L. Hitchcock. Hitchcocks-ville. Conn. Warranted. Hitchcock, Alford & Co. Hitchcocks-ville. Conn. Warranted. L. Hitchcock. Unionville. Conn. Warranted. In the second variation of the stencil, many of the chairs have two backwards "N's" in the word "CONN." This is thought to have occurred because many of the laborers who worked on the chairs were illiterate. Hitchcock chairs were usually painted black, brownish-black or dark green. They have yellow ochre pin striping with gold half-rings on the front legs. Detailed stencils painted with metallic colors like red, gold, blue and white can be found on the back and sides of the chairs. Designs include leaves, flowers, baskets of fruit and cornucopias. The backs of the chairs have either vertical or horizontal rails with a crest rail at the top.They have turned legs and some chair legs have balls on the end.The seats were usually made from rush or cane. Lambert Hitchcock would probably be pleased with what some of his earliest chairs are worth today. An original Hitchcock chair in good condition is easily worth $200-$300 and a set of four could be worth $1200 or more. That is quite a contrast from the original price of around $1.50 per chair. Antique furniture stores and antique dealers are a good place to start looking for these chairs. You can also keep an eye on the classified ads under antiques for sale in your local newspaper. If you get lucky, you might even find one in a yard sale. Your best source for locating Hitchcock chairs is the Internet. Auction sites like EBay allow buyers to determine the chair's value by bidding. Online antique stores such as GoAntiques.com and AntiqueArts.com are good sources. Use caution when buying from a private seller on sites like EBay or Craigslist. If you source your chairs this way, try to find local sellers that offer the option of picking the chairs up so that you can physically look at them before you buy. The Hitchcock Chair Company had a long legacy in furniture making, lasting from 1818 until 2006, when the company went out of business. However, in the spring of 2010, Still River Furniture, LLC (now known as Still River Antiques) bought the rights, name, plans and artwork of the original company to revive the Hitchcock furniture name and is continuing to make nineteenth century style furniture. The expert craftsmen combine the technology and tools of modern times with the techniques and attention to detail of the original wood workers to produce quality, beautiful, reproduction Hitchcock chairs. Still River Antiques also restores original Hitchcock chairs. They are located in Riverton, Connecticut. For more information on purchasing reproduction or restored Hitchcock furniture, visit their website, StillRiverAntiques.com. LoveToKnow wishes to thank Still River Antiques for providing the image for this article.